After weeks of political intrigue and street violence, Egyptians will vote this weekend on a controversial new constitution. TNR asked two analysts with differing perspectives on events in the region, Nathan Brown and Eric Trager, to weigh in on the immediate and long-term future of the world's most influential Arab country. TNR: What exactly is in the newly drafted Constitution? Does it really privilege Islamists? Nathan Brown: Most of the complaints in Egypt about the document are about process—who wrote it and how—and far less about content. You might be surprised at how little Islam enters into the vast majority its clauses. It is true that a couple of the religious provisions of the 2012 draft constitution are ramped up slightly compared to the 1971 constitution it is designed to replace. But those changes are not the product of Muslim Brotherhood pressure; they are the outcome of careful negotiation among various political forces. If they turn out to pack a punch in the coming years—and they might—it will be because of who is at the head of critical state institutions. This document does not establish a theocracy or anything close to it, but if there is a clear majority party it will enable it to pass a wide range of laws and probably slowly reshape parts of the state apparatus. There are many things for a liberal to like as well, I should add, but far less than might have been expected a year ago. Eric Trager: It's true that the constitution does not inherently privilege Islamists. But a number of key passages provide Islamists with a substantial foothold for instituting their authority and advancing their agenda. Articles 2 and 219 privilege religious doctrines in political debate, which create a substantial advantage for Islamists in drafting legislation. 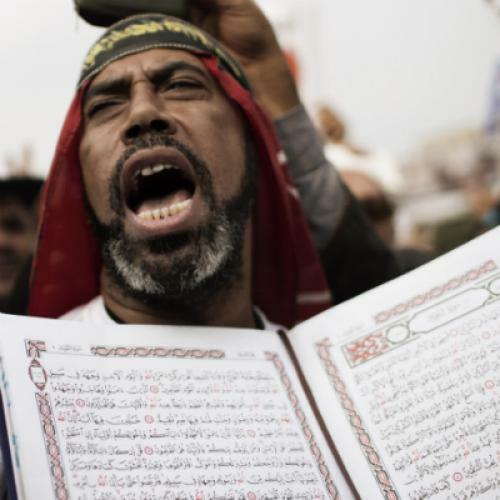 Article 11 authorizes the state to "safeguard ethics, public morality, and public order, and foster a high level of education and of religious and patriotic values," thereby carving out a potentially large role for Islamists to enforce religious doctrines. And Article 44 prohibits the "insult or abuse of all religious messengers and prophets," which provides an opening for Islamists to use religious justifications for curtailing free speech. Nathan is correct when he writes that these changes in the constitution's religious language are "the outcome of careful negotiation” and "not the product of Muslim Brotherhood pressure." But it is worth noting that the "political forces" with which the Muslim Brotherhood negotiated these new clauses are, in fact, radical Salafists. This may be a sign of things to come: rather than being a broadly inclusive democracy, Egypt could become a competitive theocracy, in which two distinct visions for Islamic rule—that of the Brotherhood and that of the Salafists—vie for dominance, while the space for non-Islamists rapidly shrinks. I agree with Nathan that the constitution does not establish a theocracy; indeed, Article 5 stipulates that "Sovereignty is for the people alone", and not God. But given Egypt's current political dynamics, in which Islamists remain the best mobilized political force, Islamists will likely be the first to interpret and implement this constitution draft. Brown: Let me point to two areas where I would not go as far as Eric does. First, with regard to the bargaining over the religious clauses, my impression is somewhat different than his. I do think Islamists served themselves well in the draft document. And yes, Salafis were involved—but so were non-Islamists, representatives of al-Azhar, and Christians. All of these other forces were very worried about Salafi attempts to put real teeth and specificity in the constitution's provisions for the Islamic shari'a. I do not see the result only as a result of an Salafi-Brotherhood bargain; such a document would have looked quite different. Second, Eric and I may have a terminological difference that may have some significance for how we read the document. If I understand correctly, he uses the term "theocratic" to mean strongly religious and in opposition to "democratic." I take a real theocracy to be one which grants political authority to those who claim religious authority or that gives a religious role to political authority. That would be anti-democratic. But that is not what this document does. (The closest it comes is article 3, which gives an advisory role to a body of religious scholars in al-Azhar.) Instead, whatever religious flavor emerges—and it could be a very strong one, especially over time—will happen directly through, rather than working around, the democratic process. TNR: Morsi has repeatedly cited his concern that Mubarak loyalists within the state and in society are trying to subvert his government. Is that a real cause for concern? Trager: It is certainly true that members of the old ruling party and Mubarak appointees remain active, particularly on the judiciary. But the available evidence suggests that the Brotherhood's concerns are more due to paranoia than an actual campaign of subversion by the "deep state." For example, the Muslim Brotherhood points to the Supreme Constitutional Court's decision to invalidate parliamentary elections, while at the same time striking down a law that would have prohibited old ruling party leaders from entering politics, as the ultimate proof of subversion from Mubarak partisans. But the SCC invalidated the elections because their structure disadvantaged independent candidates, which was, in fact, the same reasoning that the courts had used to invalidate elections under Mubarak in 1987 and 1990. It is also worth noting that SCC chief Farouk Sultan, despite being a Mubarak appointee, oversaw the comission that declared Morsi the winner of Egypt's presidential election. Brown: The Brotherhood has undoubtedly made mistakes as a result of succumbing to its own anxieties. Yes, various parts of the state apparatus were resistant to the Brotherhood; Egypt's Islamists have real adversaries who do not always play fair. But Egypt's judicial actors, the Supreme Constitutional Court, weren't simply acting as Mubarak cronies; they were primarily interested in protecting their own autonomy. Aside from his sudden move reshuffling the top military brass in August, Morsi seemed to be moving slowly to assuage and persuade such actors. The constitutional process also offered the promise of a slow renegotiation of the rules of the political game and reshaping of the Egyptian state. That process was moving in the Brotherhood's favor, despite resistance from inside and outside of the state. But by treating political challenges as a mortal threat, the president and the Brotherhood have turned smoldering rage into a horrific blaze. The president may well win, but it could be a Pyrrhic victory of sorts. TNR: Assuming that the constitution wins the referendum, do you think the liberals and others who boycott will ever recognize its legitimacy? Do you anticipate they will also boycott the next elections? Brown: If the referendum proceeds and passes, it will engender bitterness. Blood has been shed and both sides see themselves as victims of the other. And it may engrain some bad habits--for Islamists to push for voting no matter what, and for their opponents to see taking to the streets as the only option. Could it eventually evolve in a healthy direction? Yes, that is possible. It is difficult to envision all of the opponents of Islamism permanently boycotting parliamentary elections. Some will run. And if they manage to transfer their obvious energies to parliamentary election campaigns, there might be a viable opposition in parliament. Trager: But the non-Islamists would likely lose badly in parliamentary elections. Despite anticipating these forthcoming elections for many months, the non-Islamists have not done any kind of campaign organizing or serious party building. And though the non-Islamists have twice demonstrated their ability to unite against the Muslim Brotherhood—during the second round of the presidential elections, when Mubarak's former prime minister Ahmed Shafik got 48.2% of the vote, and during the current anti-constitution protests—they otherwise remain deeply divided among leftists, socialists, communists, Nasserists, Christians, ex-NDP members, and a handful of liberals. And within each of these categories, there are multiple parties that will cancel out each others votes. The Brotherhood, by contrast, is structured to ensure its cohesion. Brown: Perhaps, if the Islamists falter in governing or manage another clumsy misstep the opposition could eventually make some significant electoral gains, and that would serve to settle both sides. But both camps have dug themselves in so deeply now, it is difficult to see such an optimistic scenario developing right away. The best that can be hoped for is a very slow healing, and that process has not even begun. TNR: How would you assess America's diplomacy towards the Morsi government so far? What do you think the United States policy towards Egypt should change in the months and years ahead? Trager: My own view is that the administration is correct in seeing no real alternative to Morsi, but wrong in believing that Morsi or the Muslim Brotherhood can be partners on foreign policy in the long run. In recent months, the Muslim Brotherhood has signaled repeatedly that it intends to move against our interests: the group's Supreme Guide has called for jihad for Jerusalem twice in the past two months, including right after the Gaza ceasefire; a top foreign policy official declared in November that Morsi is ending normalization with Israel slowly; and the Brotherhood's political party has been drafting legislation for the next parliamentary session on unilaterally amending the treaty. Moreover, it's worth noting that the Brotherhood repeatedly turns on its allies. (Consider, for example, the case of April 6th Youth leader Ahmed Maher, who prominently supported Morsi during the second round of the presidential elections but, after opposing Morsi's power grab, was accused by the Brotherhood of leading "thugs" in demonstrations.) If the Brotherhood has no qualms about turning on its most prominent non-Brotherhood supporters within Egypt, it will have even few qualms about turning on America. This is why it's so important for the Obama administration to push back on Morsi's domestic power grab now, by raising public concerns over the legitimacy of the constitutional referendum. Failing to do so will convince the Brotherhood that it can get away with anything, and encourage them to move to act on their foreign policy ambitions sooner. Brown: Underlying the differences between Eric and I is one area of agreement: the Brotherhood's rise represents a challenge for the U.S. because the movement's policy preferences are very much at odds with U.S. policy in the region. Even under the best of circumstances, that will require readjustment. And the best of circumstances do not seem to be likely to prevail any time soon. The question posed to us is what to do about it. And here we have to factor in not only policy preferences but tools. I worry that our position is simply not one that will alow us to convince the Brotherhood (or its opposition) of anything. I think we do have some ability to affect the course of Egyptian political reconstruction, but our preferences simply cannot be automatically translated into outcomes. If we wish to have a more stable and consensual political environment in Egypt (and I think we do), then we can communicate to the president that his international standing will depend in part on his ability to represent the entire Egyptian nation--and that requires that he act like a president, not a partisan figure, and reach out with real and tangible concessions to the opposition. We can speak to the opposition to, although here we need to be careful. Eric's suggestion that we treat the referendum as illegitimate would essentially be seen as partisan; worse, it might encourage the those elements within the opposition who tend to rally around maximal demands and then look for some savior—the army, the judiciary, and now us—to deliver them from the choices of their own fellow citizens. A set of realistic demands (such as constitutional amendments, a requirement of super-majorities in parliament on critical issues, and more robust guarantees for international human rights standards) might be promised a sympathetic international ear.